During the Battle of Britain, RAF Duxford was a fighter airbase. No. 264 Squadron (Defiants) flew from Duxford from 10 May 1940; No. 19 Squadron (Spitfires) from 3 July 1940; No. 310 Squadron, Czech, (Hurricanes) from 10 July 1940; No. 46 Squadron (Hurricanes) from 18 August 1940; No. 312 Squadron, Czech, (Hurricanes) from 29 August 1940; No. 242 Squadron, Canadian, (Hurricanes) from 26 October 1940 (commanded by Douglas Bader); No. 19 Squadron (Spitfires) from 30 October 1940. Fighter Command Air Chief Marshal Hugh Dowding had given each Fighter Group an area of the United kingdom to protect. 12 Group and 11 Group split responsibility for the vital area of London, but 11 Group was more directly in the path of the German assault. Douglas Bader, CO of 242 Squadron, and Trafford Leigh-Mallory advocated reducing losses by using large formations of fighters involving several squadrons, called a “Big Wing,” to attack German bombers. Bader rose to become a Group Leader, commanding No. 242, 19 and 310 squadrons as 12 Group Wing. RAF Duxford's sector station control would report the status of their fighter squadrons to Fighter Command, who would plot out all the squadrons' actions. 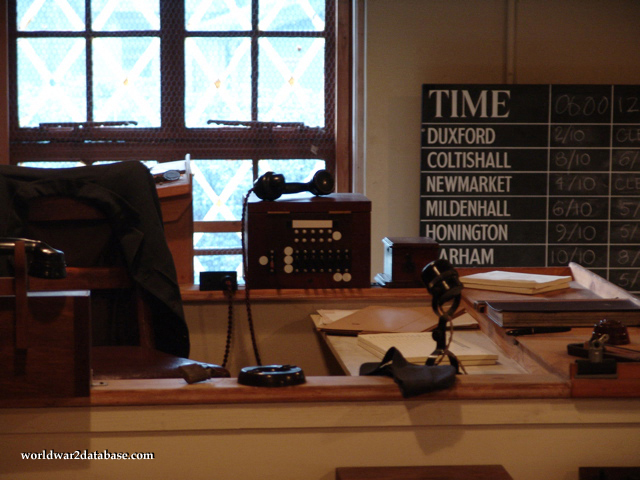 RAF Duxford Operations Room would track Duxford's fighters as well as surrounding fighter airfields. You can see a list of those airfields in this view.